We’re taking a little break right now, but 2011 is right around the corner and the ‘Skull will be back in action before you know it. 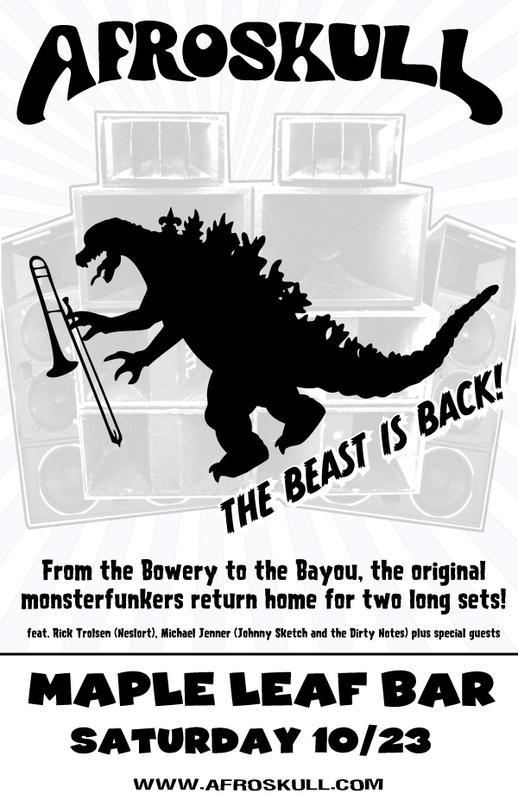 Join us at the Bitter End on January 28th for another great set of super-funk. More details coming soon. Up next on the ‘Skull schedule: a free late-night show at Rockwood Music Hall on Friday night, September 24th. We’ll be going on around midnight following a set by Jamie Masefield’s Jazz Mandolin Project. We’re very psyched to be part of such a great bill at one of NYC’s best venues. And did we mention our set is free? 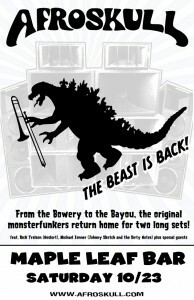 And for our New Orleans fans, don’t forget we’ve got one monster of a show coming up at the Maple Leaf on October 23rd. We’re back at our home away from home, the Parkside Lounge on Manhattan’s Lower East Side, on Friday August 27th at 8pm. We’ve got Bearded Jon back on bass and special guest Aya Miso on keyboards. We always have a blast at the Parkside so don’t miss it! And stay tuned because we have some very cool shows coming up in the fall, including a free late show at Rockwood Music Hall on September 24th, and our first gig in New Orleans since 2007, on October 23rd at the Maple Leaf. We’ll be announcing some more soon, so keep an eye on our Facebook and Twitter feeds for all the latest and greatest. Join us for another great night of epic funk-rock jams! Blue Food starts the night off at 10pm with their unique brand of math funk. Next up, hot off the release of their new CD, OTiS brings their soulful sound to the stage at 11pm. Then at midnight, Afroskull returns for a long set of our patented superfunk with a special guest all the way from New Orleans – Afroskull founding member Bill Richards on bass! Bill will tackle the band’s current repertoire with ease, and we’ll be sure to bring back a couple of B-Funk classics from our New Orleans days. And if you can’t be there in person, watch it live on the web at bowerypoetrylive.com! Sadly, our show at the Bowery Poetry Club this Friday has been canceled due to circumstances beyond our control. We’ll be back next month for our first ever show at the Mercury Lounge on June 12th! Our good friends OTiS will be playing too.